We run a shop built on European city and cargo bicycles, so it makes sense that people come to us for all those great European bike parts and accessories that nobody else carries. 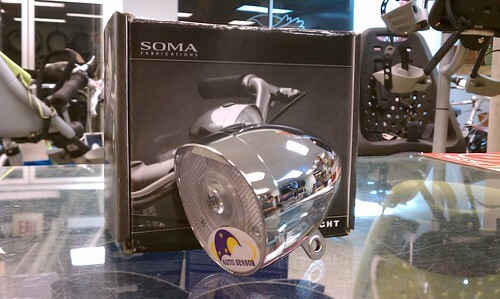 Add to that list of stuff we carry the awesome SOMA Torpedo headlamp. We ordered a bunch of these after fielding dozens of requests for a European-style retro headlamp. These are very well made, they look great, and (at the time of this writing) retail for $40.